Cleanse Fire is written from the POV of captain Derac Vidor, a man tormented by a haunting past who is now in charge of one team of the Kinir Elite soldiers and charged with the task to rescue faeries from a dwarven mine. Derac himself is an elf, which I thought was pretty cool. A lot of times we read about elves in fantasy, but hardly ever does an evil play the main role. Derac has a troubled past, and it shows, as the events that transpired years ago still inflict upon his current day decisions. He’s wary of risking his team, of loving anyone in case they may get hurt or even killed. One of his team members, Kierianna, is a beautiful, strong elfa (female elf) and Derac feels attracted to her, but refuses to act on his impulsions. When Derac and Kie get trapped in the dwarven mine, and Kie is forced to relive parts of her past she hoped never to relive again, they form a bond. Derac is forced to face his emotions, let go of the past, and learn to live in the present. I thought the story was pretty strong, and I enjoyed the plot as well. The world building felt a little incomplete: the main characters travel from place to place, and even though each place is well-described, it feels like something is missing. Maybe we’ll get to see more of this world in the second book, and that’ll solve the problem. It could also be that, while we go from place to place, we don’t really live through the journey. We get a faint idea of how many days our main characters travel, but we don’t really live through those days. Or something. It’s hard to explain. I liked the plot though, because it was something different. The main characters are all well-trained, elite soldiers who face danger not because of some ancient prophecy or magic curse, but something a lot more mundane (and a lot more intriguing): their commander is trying to screw them over. I liked the team’s interactions, and want to see more of them. Derac and Kie stood in the spotlight here, but I wouldn’t mind reading a book focusing more on some of the other secondary characters, since they all have great potentials as protagonists. I liked Derac, but I only liked Kie so-so. At times she was a valuable, strong, clear-minded member of the team, but whenever she was in danger, she always needed someone to rescue her, which annoyed me. The other elite soldiers seemed a lot more self-relient. Either way, I enjoyed this book. It’s well-written, the plot is fast-paced and it’s fantasy with a unique twist since it doesn’t feature the end of the world or a “chosen one”. 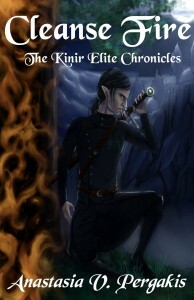 Derac is just an ordinary elf with a troubled past, forced to deal with his commander’s betrayal. I would love to read the second book in this series when it comes out. A recommended read for fantasy fans. Enter to win an e-copy of “Cleanse Fire”. Winner will be announced on the Kinir Elite facebook page and as a final comment on this blog post after the deadline. Winners will contact the author directly to receive their prize! Thank you so very much for an indepth review! I truly appreciate it!